Ghost gear is the lost or abandoned gear in the ocean. It mostly consists of passive gear such as gillnets and lobster traps. Netting, ropes, and monofilament prove to be hazardous to many marine animals, including whales and seals. The animals can get wrapped in gear, causing severe wounds and/or limiting their ability to move and forage for food. A popular haul out beach for gray seals on Nantucket. Can you find the seal entangled in yellow rope? Nantucket has a large population of gray seals, and on Friday afternoon three entangled seals were reported to the Nantucket Marine Mammal Stranding Team (NMMST) by a group of well trained and experienced New England Aquarium field volunteers. Since our response time is very slow to get to the islands, we rely heavily on our fantastic volunteers. Two of the seals had monofilament around their neck, and the other was wrapped in yellow rope and netting. NMMST successfully disentangled all three seals that afternoon and each went back in the water right away! The next night we received a report of an entangled gray seal on Martha's Vineyard. This seal had several layers of line around its neck, as well as a thicker nylon rope with small buoys attached to it. We tracked the seal in and out of the water for several days and when it finally decided to haul out where we could get access to her we did. First thing the next morning (responding in the dark is too dangerous), three of our excellent field volunteers on Martha's Vineyard responded to the seal. They were able to cut off the gear and perform a health exam. With no severe injuries and no permanent disabilities from the gear, she was immediately released back to the water. The gear collected from these seals will be sent to the National Marine Fisheries Service, where they will assess the type of gear the animals are being entangled in and learn more about the effects. The gray seal on Martha's Vineyard was successfully disentangled and immediately returned to the water. There are many ways you can help. When fishing, make sure all your gear is accounted for and it leaves the water with you! You can also participate in coastal beach cleanups in areas near you. If you see an entangled seal, please call our stranding hotline at 617-973-5247. When I first started at the New England Aquarium as a volunteer in the Rescue and Rehabilitation department I was so excited to be working with seals and dolphins. Then, my first sea turtle cold-stun season began and I developed an additional passion. 2002 was a big year for stranded sea turtles. We had 101 animals come to the Aquarium and of those 69 survived. Working with the turtles during that season changed my focus from the "charismatic" mammals to the "stoic" "knowing" sea turtles (I still do get a thrill when working with the mammals though). It was pretty crazy when new turtles were arriving daily, sometimes seven or eight animals at a time. They would be coming in at staggered times up to three trips from the Wellfleet Audubon per day. 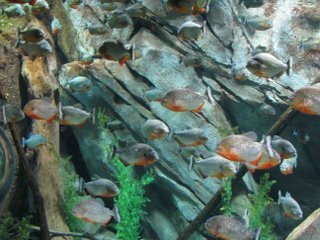 They would be lined up and down our hallway in different areas of the Aquarium swimming at different temperatures and salinity. It was a rush. These animals were amazing. They would look like they were dead, but then you would find that one faint heartbeat or see a very slight movement or twitch and they would make full recoveries. So, why this trip down memory lane? We received a message this week about two sea turtles that were released within this past week which, had arrived during the 2002 cold-stun season. Dumbledore and Hagrid were two of four hybrids that cold-stunned that year. Both turtles were quite aggressive. Jen(another current staff member) and I were put in the pool when they were introduced to each other to make sure that if they became aggressive with each other, we could be there to separate them. I think that seemed like a good idea at the time. Unfortunately they did not get along and had to be separated. Both turtles ended up fracturing front flippers and they had to be stabilized surgically. We are not positive as to what the cause of the fractures were but were unable to be released at the time so they were transferred to the Columbus Zoo in Ohio to continue rehabilitation. About two weeks ago they were transferred to the Virginia Aquarium in hopes to be released off the Virginia coast. 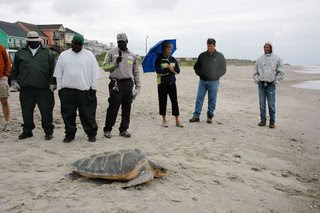 The water was still not warm enough so they brought the turtles down to North Carolina where they were released. Both turtles gained almost 70 kg (154 lbs) during the past seven years and have had quite an adventure at the beginning of their lives. The great collaboration between everyone involved has culminated in what we in the rehabilitation world see as our ultimate goal: the release of a wild animal back to it's natural environment. It was very exciting for me to hear about their release because personally it has allowed me to reflect on my time here and see two old friends make it home! Among the many turtle projects in which we participate, one of my favorite is the Massachusetts spotted turtle survey. The spotted turtle (Clemmys guttata) is a beautiful, small, freshwater turtle species from the eastern United States. It prefers wet meadows, swamps, and other shallow wetlands. It is active from April through October, and hibernates underwater in the winter. The most active time of year is April through June, which is their breeding and nesting season. Spotted turtles are relatively rare in Massachusetts, and for many years they were listed as a Species of Special Concern, and were legally protected. Several years ago, though, they were removed from the list of protected species, as some scientists felt that they may be more common than previously thought. As with all conservation issues, there are people on both sides of this argument, and many turtle biologists are still quite concerned that spotted turtles are becoming more rare. To try to address this debate, the state of Massachusetts has started a spotted turtle survery program, where volunteers are assigned to visit known spotted turtle sites each year, and count the number of turtles that are found. Each turtle is numbered by a series of small notches on their shell so that they can be identified in the future. The attached images were taken by NEAQ biologist Adam Kennedy and me at one of our assigned study sites. It shows a beautiful adult male spotted turtle on a beautiful New England spring day. On this day, we found three turtles, including one female that I had marked last year. 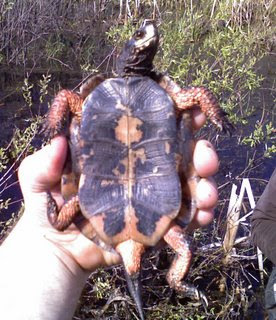 If you see a spotted turtle in the wild, please report it to the Masssachusetts Natural Heritage program so that it's location can be recorded. If it is on a road, please try to safely help it across (think about your own safety before you do this!). Sadly, we have already seen three spotted turtles killed by cars this year at one of our study sites. Although these turtles have been removed from the protected list, it is still illegal to keep them as pets in Massachusetts, so please leave them where they belong. Iceman is a Kemp's ridley sea turtle that arrived to the New England Aquarium on November 20th 2008. The turtle stranded in Eastham at Cole Road Landing. Overall the turtle was not too bad off. You can see above what it looked like upon arrival with the dried algae covering the majority of the carapace (top part of the shell) dehydrated and emaciated all symptoms of cold-stunning, which is the primary reason for this turtle stranding. Goose our green sea turtle arrived on the same day as Iceman. Goose... Iceman... Top Gun anybody? Goose was actually named after the gooseneck barnacles on the carapace. Iceman's name stuck! This turtle is doing great! Swimming and eating well, you can currently see this turtle with Casper in the right hand side window of the recovery room. Hint: When trying to see the turtles in their underwater windows of the recovery room, if you don't see them swimming around or in one of their hideaways look to the bottom left corner; they like to rest there. Currently we still have six sea turtles here in the Rescue and Rehabilitation department. You might know these turtles already, and if you don't, follow the link to read all the posts about them. They are all still located in the Sea Turtle Recovery Room. The space that housed the Sea Turtle Recovery Room is now The Trust Family Foundation Shark and Ray Touch Tank. Rescued sea turtles are now cared for at the new, much larger Animal Care Clinic in Quincy.] There are two other turtles in there that you don't know about yet. The first one is Dash. Dash came to us on November 1, 2008 from First Encounter beach in Eastham MA. Primary reason for stranding was due to cold-stun but this turtle had a 3 cm laceration on the left rear flipper (LRF). This laceration was repaired with staples. 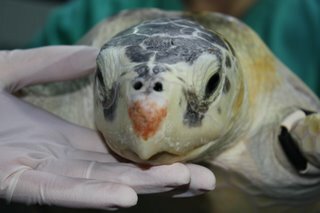 The turtle started doing well and was transported to the University of New England in Biddeford to make room for more turtles that were stranding on Cape Cod. When we opened the Sea Turtle Recovery Room this was one of the turtles that came back to us. By then the staples had been removed and the laceration was completely healed. There was still some swelling and the turtle did not use that flipper all that often. We put it into one of the tanks that had a high flow rate giving it some turtle physical therapy like we gave Route. Currently you can see Dash in the left window of the Rehab Center enjoying the hideaway and the turtle treadmill. Stay tuned for a future post about another turtle you might not know about ... Iceman. Back on terra firma here in Boston and preparing for my sea turtle lecture. I have been invited to give a lecture on leatherback sea turtles for the Aquarium Lecture Series. 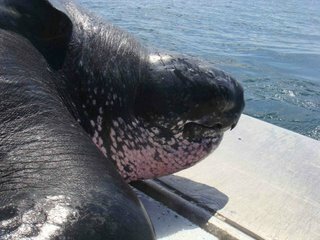 For those of you who have never seen a leatherback sea turtle, they are truly amazing creatures. I liken them to dinosaurs of the sea due to their prehistoric appearance and gigantic size. I have been conducting a research study on leatherbacks for the past four years. Pictured here are two different leatherbacks I worked with during my field work (click to enlarge). Note the prehistoric look of these giant reptiles. I'll be detailing the project during the lecture so I can't give away all the secrets here! The leatherback is the largest sea turtle in the world. They can reach weights upwards of 1,500 - 2,000 pounds--try catching one of these at sea! There are multiple threats to leatherback sea turtles which, continue to put this species at risk. I'll also be talking about those threats on Monday night. After leaving the nest as hatchlings, male leatherbacks never come ashore unless they are injured or wash ashore dead. Females, on the other hand, will come ashore during their adult years to nest. Leatherbacks are very difficult to rehabilitate. The New England Aquarium is one of only a handful of institutions to attempt leatherback rehabilitation. . Reporting after a visit to the Georgia Aquarium. Unfortunately, we arrived a lot later than anticipated and had trouble parking the giant cargo van in the city, so we only had time for a quick visit. When we arrived, we met staff veterinarian Aimee Berliner for a behind-the-scenes tour. First we headed off to see the medical facilities. As we know all too well here at the New England Aquarium, treating aquatic animals requires specialized equipment and treatment areas. Next we viewed the beluga holding area and a fantastic coral tank. We were running short on time at this point as the Aquarium was about to close, so Aimee released us into the public areas so we could have a look at the Ocean Voyager Tank. As the staff were preparing to close the building, Kate was able to snap a few quick shots as we were making our way out. Thanks all for reading about our adventures here in the South. Visiting other facilities is important for information exchange and maintaining strong relationships with colleagues in the aquarium and zoo community. Kate and I continued our trip with a visit to Zoo Atlanta. Zoos and Aquariums are linked through an organization called the Association of Zoos and Aquariums (AZA). To become a member of AZA, each institution must complete a rigorous application and inanection process to achieve accreditation. In addition to AZA, many aspects of animal health, behavior, nutrition and general husbandry are related. We had the good fortune of a tour with Zoo veterinarians Dr. Hayley Weston Murphy and Dr. Sam Rivera. Dr. Murphy is the chief veterinarian at Zoo Atlanta and among other areas of exotic animal expertise; she is one of the nations leading experts in gorilla health. She manages the National Gorilla Cardiac Database, and is a veterinary adviser for both the gorilla and baboon Species Survival Plan. Bostonians may remember her as the Veterinary Director for Zoo New England. Dr. Sam Rivera also has extensive clinical expertise with exotic animals, specializing in avian and reptile medicine. 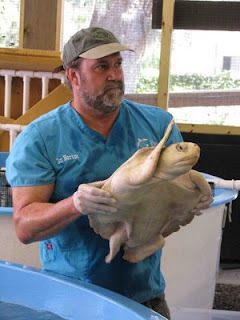 I met Dr. Rivera at a sea turtle workshop where he presented results for his ultrasound study on sea turtles. Dr. Rivera and Dr. Murphy were on call in case anything went wrong during the southern portion of our sea turtle transport. Thankfully it was smooth sailing and their services were not needed. We started with a tour of the animal hospital and medical facilities and then headed down to the primate enclosures. We observed the animals in the gorilla habitat while our hosts described the complexities of primate care. Zoo Atlanta is committed to gorilla conservation and partners with the Dian Fossey Gorilla Fund International to help achieve it's mission. You may recall that the Hollywood movie Gorillas in the Mist (trailer) was based on Fossey's work. 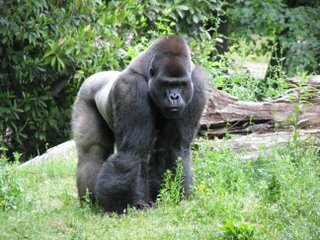 The photo above is a male Western lowland gorilla. These gorillas are the largest primate species and can grow to upwards of 500 pounds. Gorilla's are endangered and at risk for many reasons. Habitat loss and the bushmeat trade seem to be high on the list of risks. The Zoo has a fantastic Panda Cam on their website. I highly recommend it however, be forewarned it can be addicting. I'm running it now while I write and the cub just woke up and toppled off one of the tree limbs in the exhibit. He's already back up on the limb laying flat on his back rubbing his belly - good thing that's not completely adorable! It's all in the lips. This black rhinoceros sleeps off the heat of the day at Zoo Atlanta. Black rhinos are currently listed as a critically endangered species. Black rhinos are distinguished from white rhinos primarily by their lips. The black rhino has a pointed prehensile lip while the white rhino is square lipped (just a little rhino trivia in case you end up on Jeopardy or Cash Cab). The Zoo has an extensive enrichment program. Zoo Atlanta's commitment to conservation around the globe was obvious from our visit and a quick read of their web site. Touring Zoo Atlanta with these two veterinarians was truly a memorable treat and one we are not likely to soon forget. 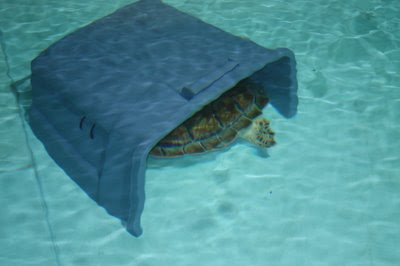 As you remember, Route came on the turtle transport to Georgia, however he was not released. 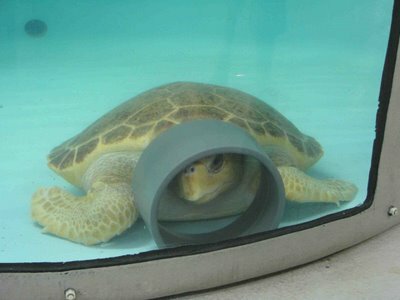 Route entered the final phase of his rehabilitation at the Georgia Sea Turtle Center (GSTC) on Jekyll Island, Georgia. In the photo at left, Dr. Terry Norton, the GSTC veterinarian and Executive Director prepares to introduce Route to his new tank. Dr. Norton had the opportunity to examine Route with Dr. Innis during a recent trip to the New England Aquarium. Safe and sound in his new tank, Route settled in quickly. Dr. Norton will monitor Route's health until he is ready for release. We expect Route will be released in the near future so we will keep you informed. Kate and I continue our journey through the deep south. Our next stop will be at the South Carolina Aquarium where we will pay a visit to their sea turtle hospital - stay tuned South Carolina gets some pretty large turtles! 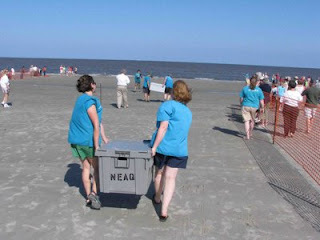 The sea turtle transport and release was a success! All the turtles did very well on the ride to Georgia. We stopped several times to do health checks and spritz them down with salt water. The drive took about 20 hours and went as well as we could have expected. Dr. Terry Norton and his staff at the Georgia Sea Turtle Center (GSTC) on Jekyll Island were ready and waiting for us when we arrived. First we situated Route into his new tank for additional rehabilitation (I'll blog more on this soon) and then we headed to the beach with the others (at right). The Staff at the Georgia Sea Turtle Center secured a release zone down at the beach so we could organize the animals and allow the public to watch from a safe distance. Bruce and Godzilla (loggerhead sea turtles) were released first. They are both quite large and we wanted to give them plenty of room. Both lumbered down the beach toward the water. Bruce stopped at one point and started heading lateral to the water. Dr. Norton re-oriented him and off he went into the deep blue. We released all the Kemp's ridley and green sea turtles at the same time and watched them crawl down to the water. It was truly exciting to see the turtles that came into the NEAq debilitated and in some cases barely alive last fall now racing back to the water! 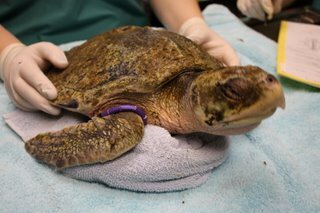 This is an update on our Kemp's ridley turtle named Orion. Orion developed pneumonia several months ago. I am happy to report that Orion is getting better. This week Orion went for another CT scan to recheck his lungs. His right lung is still not normal, but it is improving, and we think that the infection is gone. We stopped his antibiotics yesterday, and we will monitor him carefully over the next few weeks. He will have one more CT scan in June. If that looks good we will make plans to release him this summer. 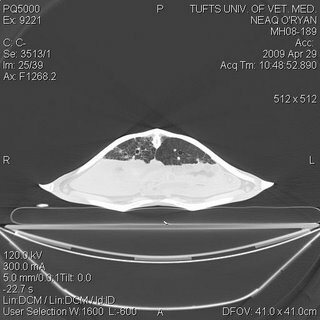 Thanks to the staff at Tufts Cummings School of Veterinary Medicine for helping with Orion's CT scan! In this image, his right lung is on your left. The lungs are the darker areas just below the top of the shell. You can see that the right lung has some white streaks in it, which indicates thickening of the tissue in response to pneumonia.